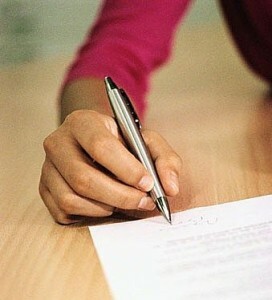 Home › FAQ › What Do Colleges Look For in an Admissions Essay? If you’ve begun the college application process, you may wonder what colleges look for in an admissions essay. With so much seemingly riding on how you present yourself in this one composition, you want to be sure to present yourself in a way that admissions representatives will appreciate. Sometimes the questions posed by colleges can be tricky. However, follow these tips to put your best foot forward toward writing a compelling essay that gets you that letter of acceptance. It may seem obvious, but it cannot be over stressed. Your essay absolutely must be well-written in order to be taken seriously for the academic skills you hope to present, according to the College Board. First, you want to be sure your writing is coherent, meaning that it makes sense and doesn’t ramble. It’s okay if your first draft gets a little sidetracked, but be sure to take the time to read what you’ve written to be sure it makes sense. Along these lines, you want to be concise in your admissions essay. Even if there is no word limit imposed, keep in mind that admissions officers read hundreds of these essays. They will appreciate one that is well-written in as few words as possible. Ask a parent or trusted person to read your essay when finished to be sure it makes sense and is not too wordy. It’s likely you will be competing with many others to receive an acceptance letter to the university of your choice. What colleges look for in an admissions essay is individuality. An essay that stands out and shows who you are will go a lot further than one that is safe and boring. Take some time to think about what sets you apart from your friends and what is most identifiable about your personality. Try to impart that feeling into your essay. For example, if you’re a caring and compassionate person, you can give examples of that. If you are funny or known as the class clown, a little humor thrown in will paint you as very likable. However, as with everything, moderation is key. Take the aforementioned suggestion of using humor to demonstrate your likability. Humor is a very subjective thing. Be careful to use it sparingly and in a way that is certain not to offend, confuse or annoy the reader. Along these lines, never embellish your accomplishments. While you want to demonstrate that you are a leader or an active community member, you never want to be anything less than truthful in your portrayal of yourself. Sharing your skills, activities and roles in an honest way is more than sufficient. You don’t have to be a star athlete or president of your club in order to be noticed by admissions representatives. These are just a few guidelines to get you started on writing an essay that stands out. Above all else, what colleges look for in an admissions essay is your truth, what will make you an asset to their student body.